The FoxFury Command+ LoPro White & Green LED Rechargeable Helmet Light provides hands-free illumination in all-weather conditions and delivers up to 100 lumens. This ultra-slim design enables the light to clear the external face shield on most U.S. modern and traditional style fire helmets. White & green LEDs are best suited for cutting through smoke in structural firefighting. 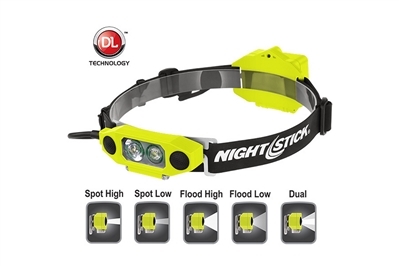 This headlamp also features a highly visible green flashing LED in the battery pack that can be seen from over 1 mile (1.6km) away. 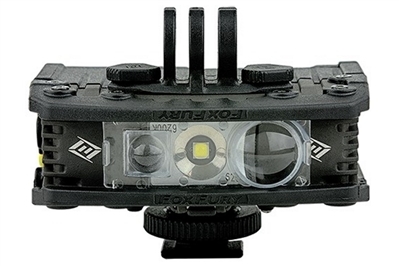 See wider and better with the FoxFury Command LoPro White LED Helmet Light. This rugged fire resistant firefighter helmet light provides hands-free illumination in all-weather conditions and delivers up to 65 lumens. This ultra-slim design enables the light to clear the external face shield on most U.S. style modern and traditional fire helmets. 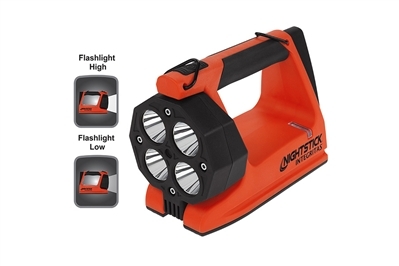 It is best suited for structural firefighting along with general area illumination. 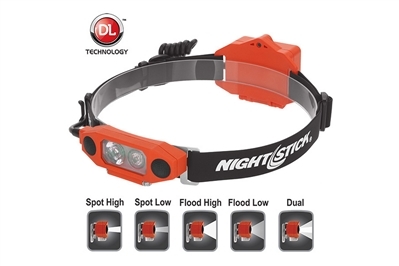 This headlamp also features a highly visible red flashing LED in the battery pack that can be seen from over 1 mile (1.6km) away. The Model 9404s are designed specifically for hands-free illumination while working, verifying or searching. The four high output LED's are ideal for standard illumination plus enhanced viewing in very low light levels, viewing for blood identification and high contrast illumination. 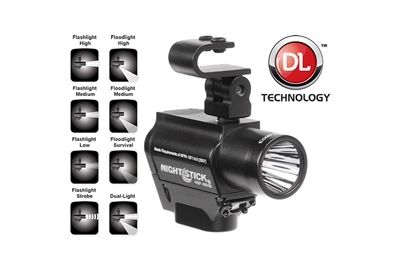 The strobe function can be activated for all colors, adding an extra dimension of user safety. Very light weight and easily clipped to pockets, belts or web gear. The DICATA™ Intrinsically Safe Low-Profile Dual-Light™ Headlamp is cULus, ATEX and IECEx listed Intrinsically Safe and is designed specifically to work on fire helmets and hard-hats that have a flip-up face shield. The unique low-profile shape allows the user to work without having to remove the headlamp when raising or lowering their face shield. The XPP-5462GX is manufactured from glass-filled nylon polymer and features a multi-position tilt head design. Both the spotlight and the floodlight use CREE® LED’s and an advanced (TIR) Total Internal Reflection lens designed to optimize lumen output and beam pattern. Front mounted dual switches provide easy access to the spotlight for distance illumination, the floodlight for close-up illumination, and Dual-Light for maximum lighting, versatility and user safety. Includes a heavy-duty rubber head strap for use on a fire helmet or hard-hat, and is powered by 3 AA batteries (included). The DICATA™ Intrinsically Safe Low-Profile Dual-Light™ Headlamp is cULus, ATEX and IECEx listed Intrinsically Safe and is designed specifically to work on fire helmets and hard-hats that have a flip-up face shield. The unique low-profile shape allows the user to work without having to remove the headlamp when raising or lowering their face shield. The XPP-5462RX is manufactured from glass-filled nylon polymer and features a multi-position tilt head design. Both the spotlight and the floodlight use CREE® LED’s and an advanced (TIR) Total Internal Reflection lens designed to optimize lumen output and beam pattern. Front mounted dual switches provide easy access to the spotlight for distance illumination, the floodlight for close-up illumination, and Dual-Light for maximum lighting, versatility and user safety. Includes a heavy-duty rubber head strap for use on a fire helmet or hard-hat, and is powered by 3 AA batteries (included). This is a battery-powered all LED Dual-Light™ Headlamp, combining a tight-beam long-throw spotlight, with a wide-beam close area floodlight. 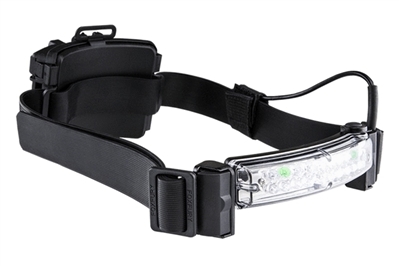 Rated at 30 lumens, the spotlight beam on this headlamp is designed for distance illumination. 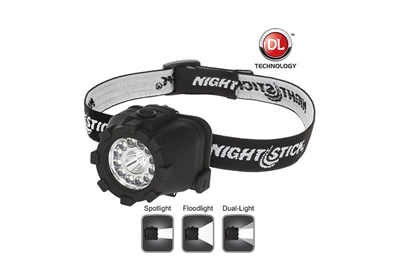 In addition to the spotlight beam, this headlamp also has a wide-beam 15 lumens floodlight. The floodlight spreads out in a wide even pattern of light expressly for the purpose of providing illumination of areas that are close by. User adjustable flashlight modes range from 250 lumens on high, 100 lumens on medium and 25 lumens on low. Dial down the floodlight to light up your gear or feet as you walk by adjusting from 115 lumens on high, to 50 lumens on medium or 10 lumens in potentially-life saving survival mode. 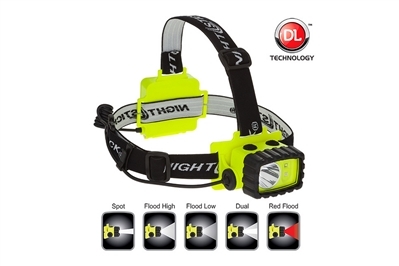 Additionally, in Dual-Light mode (both the Flashlight and the Floodlight turned on at the same time) you get 150 lumens providing maximum versatility along with user safety. The 5466 also has a green, rear facing LED light so that others can easily identify team personnel in smoke-filled or dusty environments. The FORTEM™ intrinsically safe dual-light™ flashlight is the most versatile choice for helmet-mounted hands-free lighting. 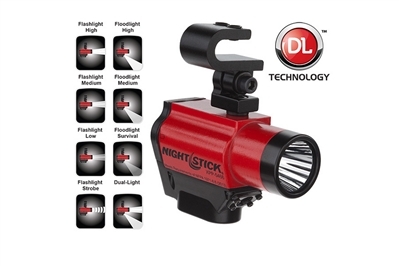 With 250 flashlight lumens that is powerful enough to cut through dense smoke combined with a serious independent 115 lumen floodlight mounted at a 45 degree downward angle, the 5466 is designed for professionals who appreciate performance and convenience. User adjustable flashlight modes range from 250 lumens on high, 100 lumens on medium and 25 lumens on low. Dial down the floodlight to light up your gear or feet as you walk by adjusting from 115 lumens on high, to 50 lumens on medium or 10 lumens in potentially-life saving survival mode. The INTRANT® Intrinsically Safe Angle Light is a Flashlight, a Floodlight and a Dual-Light Angle Light that is cULus, ATEX, IECEx, and INMETRO certified Intrinsically Safe. 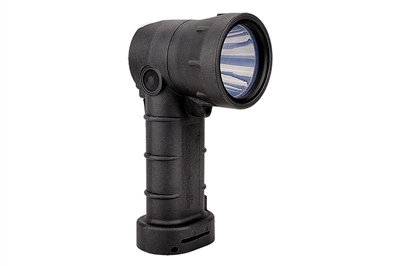 The INTRANT's flashlight pivots 90 degrees up and down with a 45 degree downward angled floodlight. The flashlight setting offers user-selectable brightness settings of 200, 110 and 60 Lumens with a 401 meter beam distance. The ultra-tight beam is perfect for cutting through smoke and lighting up objects at great distances. The floodlight setting has user-selectable brightness settings of 100, 40 and a “Survival Mode” of 20 lumens that provides just enough light in an emergency situation with a run-time of 33 hours. The Dual-Light mode allows the user to simultaneously see objects at a distance or through the smoke, as well as see the ground in front of them as they walk or work. The INTRANT is powered by 3 included AA batteries and can be upgraded to a rechargeable model by adding the optional rechargeable Lithium-ion battery pack and the charger. The INTRANT is IP-67 dust-proof/waterproof and meets requirements of NFPA-1971-8.6 (2013). 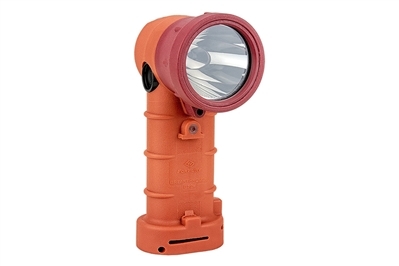 The INTRANT® Intrinsically Safe Angle Light is a Flashlight, a Floodlight and a Dual-Light Angle Light that is cULus, ATEX, IECEx, and INMETRO certified Intrinsically Safe. 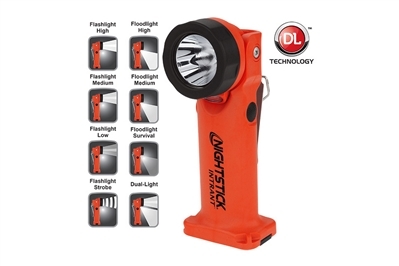 The INTRANT's flashlight rotates 90 degrees up and down with a 45 degree downward angled floodlight. The flashlight setting offers user-selectable brightness settings of 200, 110 and 60 Lumens with a 401 meter beam distance. The ultra-tight beam is perfect for cutting through smoke and lighting up objects at great distances. 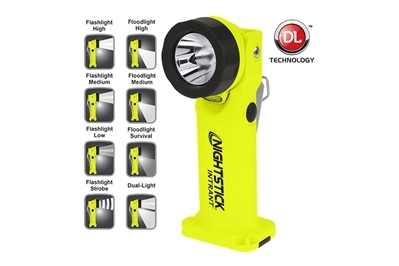 The floodlight setting has user-selectable brightness settings of 100, 40 and a “Survival Mode” of 20 lumens that provides just enough light in an emergency situation with a run-time of 27 hours. The Dual-Light mode allows the user to simultaneously see objects at a distance or through the smoke, as well as see the ground in front of them as they walk or work. The INTRANT is powered by rechargeable Lithium-ion battery pack and includes a AA Battery Carrier to provide backup power if needed. The INTRANT is IP-67 Dust-proof & Waterproof and meets requirements of NFPA-1971-8.6 (2013). 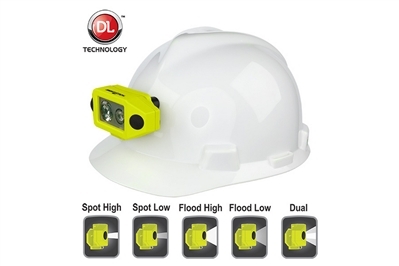 This 3 AA Dual-Light™ Multi-function Headlamp is cETLus, ATEX, IECEx and MSHA listed Intrinsically Safe Permissible. The headlamp features a multi-position tilt head design, a rear-mounted battery compartment and includes both an elastic head strap with a non-slip lining and a heavy-duty rubber strap for use with hard hats. The top mounted dual switches provide spotlight, full-power white floodlight, half-power white floodlight and red floodlight operation. Power comes from 3 AA batteries (included). This X-Series Intrinsically Safe Low-Profile Dual-Light™ Headlamp with Hard Hat Clip is cULus, ATEX and IECEx listed Intrinsically Safe. 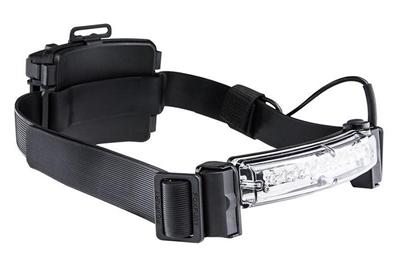 This headlamp features a multi-position tilt head design and includes an integrated Stainless Clip for attachment to most hard hat mounting brackets. Both the spotlight and the floodlight use CREE® LED’s and an advanced (TIR) Total Internal Reflection lens designed to optimize lumen output and beam pattern. Front mounted dual switches provide easy access to the spotlight for distance illumination, the floodlight for close-up illumination, and Dual-Light for maximum lighting, versatility and user safety. Includes a hard hat mount for use on a fire helmet or hard-hat, and is powered by 3 AAA batteries (included). 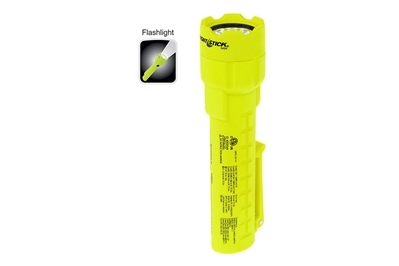 This 3 AA Dual-Light™ Flashlight is cETLus, ATEX, IECEx, INMETRO and MSHA listed Intrinsically Safe Permissible. 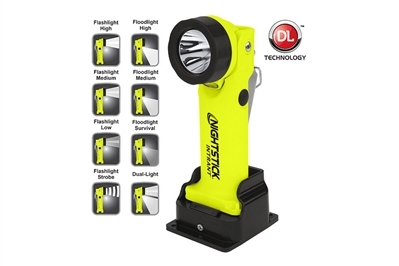 It uses a CREE® LED rated at 120 lumens that works in conjunction with a high-efficiency deep parabolic reflector to create a usable flashlight beam rated at 170 meters. A 120 lumens unfocused floodlight is integrated into the housing which is perfect for close-up illumination. 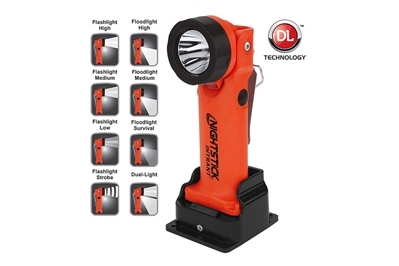 Additionally, both the flashlight and the floodlight can be turned on at the same time for maximum versatility. The dual body switches provide momentary or constant-on functionality for the flashlight and on/off functionality for the floodlight. Power comes from 3 AA batteries (not included). The Model 1632 LED Red Traffic Wand features a bright lumen output with a red cone and a black-formed handle for ultimate grip and comfort. One body mounted push button controls the On/Strobe/Off lighting functions. Pressing the button once, turns the light on constant-on mode, pressing the button a second time causes the light to strobe, and a third press of the button turns the light off. Power comes from 3 premium AAA batteries (included). 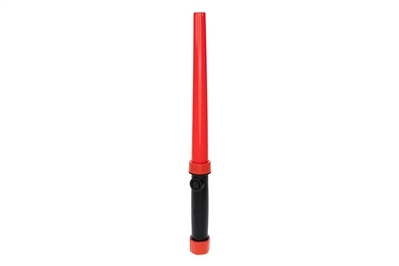 The lightweight Nightstick LED Red Traffic Wands are ideal for daylight or night applications and are the perfect choice for air ground crews, directing traffic, or marking a potentially hazardous area. 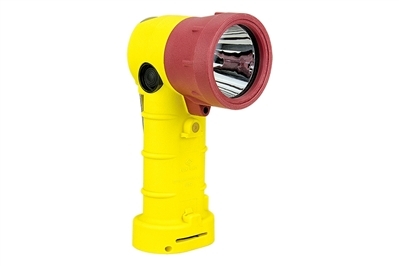 The Model 1634 LED Yellow Traffic Wand features a bright lumen output with a yellow cone and a black formed handle for ultimate grip and comfort. One body mounted push button controls the On/Strobe/Off lighting functions. Pressing the button once, turns the light on constant-on mode, pressing the button a second time causes the light to strobe, and a third press of the button turns the light off. Power comes from 3 premium AAA batteries (included). 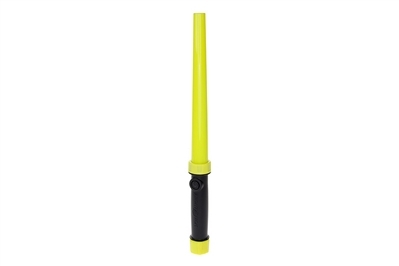 The lightweight Nightstick LED Yellow Traffic Wands are ideal for daylight or overcast applications and are the perfect choice for air ground crews, directing traffic, or marking a potentially hazardous area. 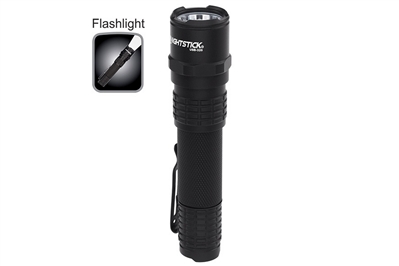 The USB-320 USB Rechargeable Every-Day-Carry (EDC) metal flashlight uses a CREE® LED rated at 320 lumens for 1.5 hours. At only 4.5 inches long and weighing only 3 oz, this compact flashlight includes a removeable deep concealment clip for ease of use in and out of a pocket. With both momentary or constant-on functionality, the USB-320 features an IP-X7 rated waterproof housing with sleeved collar that discretely opens for direct USB charging turning from red to green when fully charged. Meeting the requirements of NFPA-1971-8.6 (2013), the USB-320 is also chemical, heat and impact resistant, and includes a 2 foot USB charging cable and lithium-ion rechargeable battery. 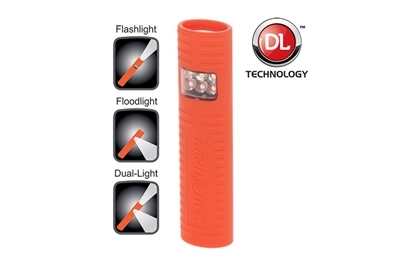 These non-rechargeable Dual-Light™ Multi-purpose Flashlights use a single body switch offering the user a choice of flashlight, floodlight or dual-light operation. The compact oval design makes them convenient to use and carry. Their water resistant housings are made from engineered polymer and have a soft touch finish. Power comes from 2 included AAA batteries.